Exosomes are lipid-bilayer-enclosed extracellular vesicles in bodily fluids. The composition of proteins, nucleic acids, and lipid in exosomes is reflective of cell functions and conditions. An increasing number of exosomal proteins have been found to be potential biomarkers for cancers and other diseases. Exosomes play a vital role in cellular signaling in both normal physiology and disease states, particularly cancer. Exosomes are powerful progenitors in altering target cell phenotypes, particularly in tumorigenesis and cancer progression, with the ability to alter tumor microenvironments and to assist in establishing the pre-metastatic niche. Many aspects of exosomes present them as novel means to identify cancer biomarkers for early detection and therapeutic targets, and using intrinsic and engineered characteristics of exosomes as therapeutic devices to ameliorate the progression of the disease. OriGene offers a wide range of ready-to-use reagents of cDNA/RNAi/protein/antibody to facilitate your exosomal biomarker research. 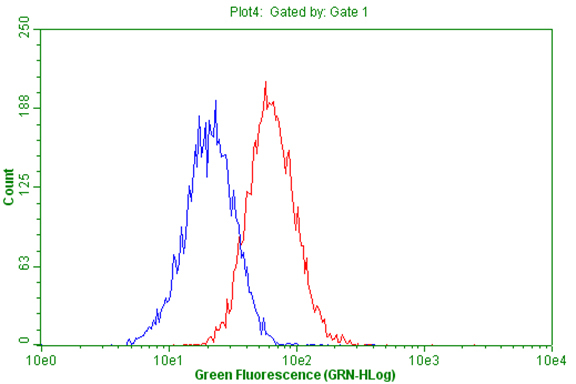 Flow cytometric Analysis of living A549 cells, using anti-CD63 antibody (TA802751), (Red), compared to a nonspecific negative control antibody, (Blue). 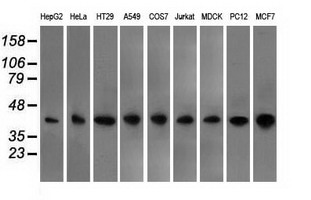 "Exosomal Proteins as a Diagnostic Biomarkers in Lung Cancer." Sandfeld-Paulsen B. et al. J Thorac Oncol. Jun 2016. "The biology and function of exosomes in cancer." Kalluri R. et al. J Clin Invest. Apr. 2016. "Exosomes: Potential in Cancer Diagnosis and Therapy." Munson P. et al. Medicines (Basel). Dec. 2016. ClinicalTrials summary for clinical studies of exosomes.